You would think after my last camping trip, I had enough cold camping. But when you find a group of like minded individuals, things start to sound like a good idea. 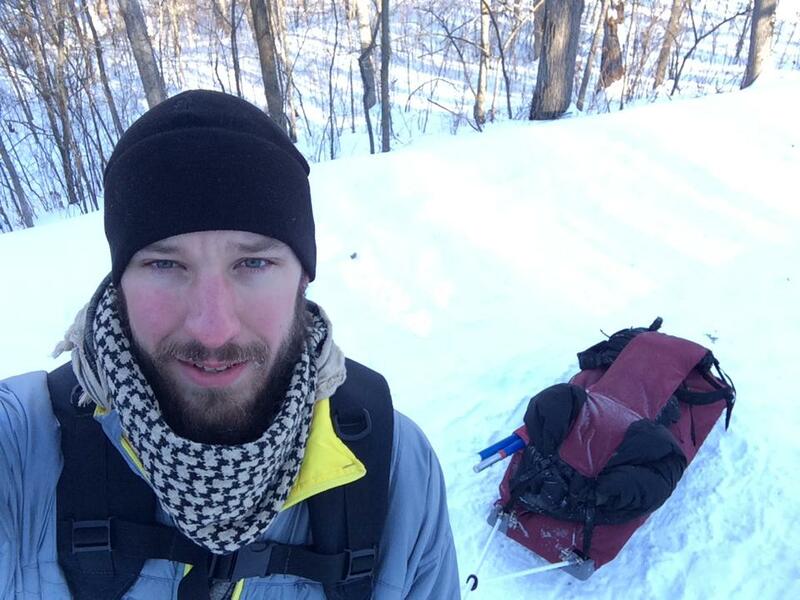 And that’s how I ended up sleeping in a tent on top of a bluff on a -17 degree (Fahrenheit) night. It was a beautiful clear weekend… with high temps around zero. 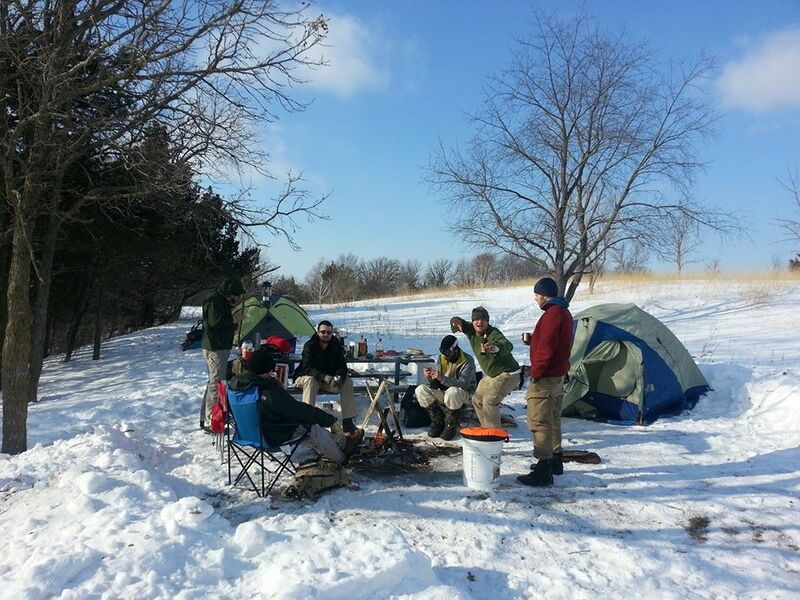 We had plans to do one-night of cold camping at Afton State park in mid January. This, of course, was during the winter of 2014’s occupation by the Polar Vortex, so it was forecasted to be far colder than the last time I camped at Afton. There is an old Norwegian saying that goes, “There is no such thing as bad weather, only bad clothes”. This adage holds more true during a Minnesota winter than ever. 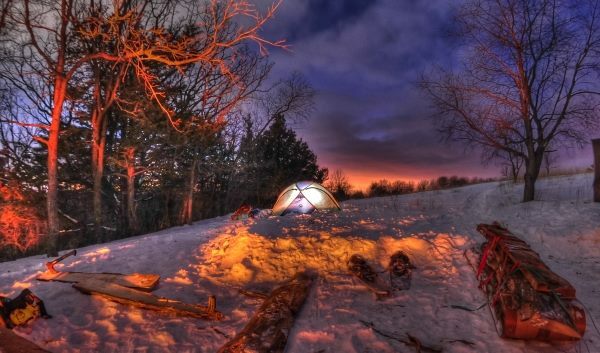 Spending a night at negative temperatures requires preparation, a little experience, and a willingness to step out of your comfort zone. But believe it or not, it can be done comfortably. In very low temperatures, your gear load gets a bit heavy. This is where a pulk becomes handy. It’s basically a sled that attaches to you with poles. A pulk allows you to carry your gear with far greater ease than a backpack. Although climbing hills can be more cumbersome, it’s worth the saved effort over the long haul. And the best part is, it’s a sled, so downhills are ridiculously fun (and maybe a tad dangerous). Pulks are best paired with snowshoes for traction. 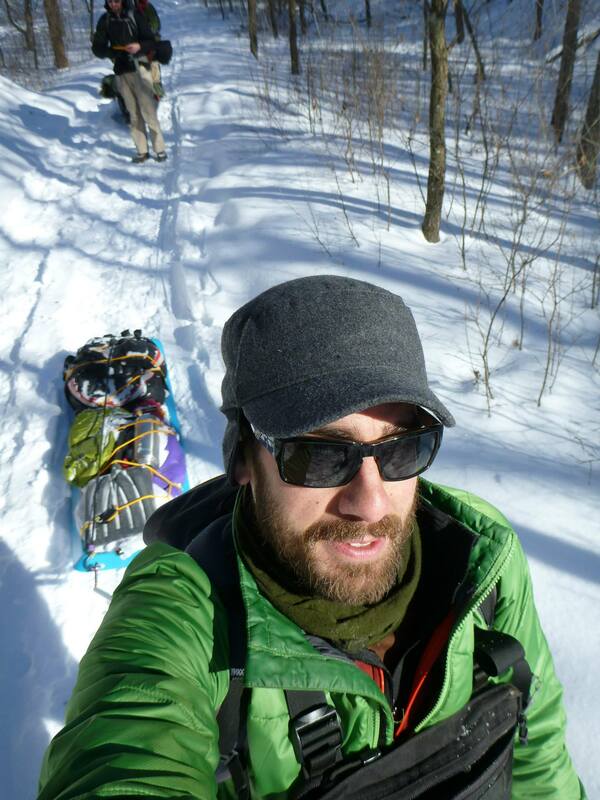 Hiking around in the snow without snowshoes or skis can be quickly fatiguing. It was a beautiful sunny winter day, albeit only 5 degrees outside, when we parked our cars in the lot at Afton State Park. Cooper, Josh, Torry, and I prepared ourselves for the brief hike of about a mile to the backpacking sites, which included a steep down-climb over snow covered trail-stairs into the valley and a switchback trail ascent to the ridge top sites. The snowshoes quickly demonstrated themselves as an advantage over just boots (thanks to Josh for letting me borrow a pair) as they allowed a far more controlled descent into (and later climb out of) the valley, especially with a 50 pound sled in tow. Even in single digit temperatures, with no wind and clear skies, our layers quickly peeled off. The body generates a lot of heat when moving, and you don’t want to sweat out your clothes. Wet and cold isn’t anything to mess around with below freezing. We met Jason, Matt, and Byron at camp in 20 minutes or so, and prepared the site. 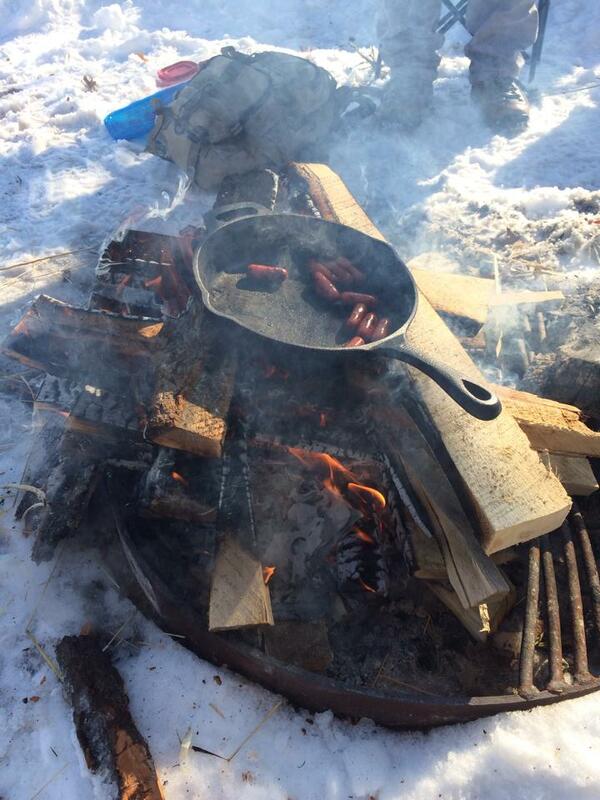 The fire ring was somewhere under the 18 or so inches of snow. We decided the person to find it first got to drink from the fire hose. Clearing a site of snow isn’t a necessity, but it prevents the site from getting sloppy. With the fire ring found and tent pads cleared, we pitched our tents and built a good sized fire to cope with the falling temps. One major reason that we selected Afton State Park is that they provide firewood for backpack campers. Without moving around, it would be hard to survive in the open air without a constantly fed fire. But with the fire roaring in front of us, our Reflectix chair pads behind us, and warm beverages in us, we were more than coping with the conditions. The mercury continued to fall as the night moved in and our metabolisms slowed; the chill started to set in. I headed for bed, hoping that my sleeping arrangement would bring some warmth to me. I heated up a Nalgene bottle of water and tossed it in the foot of my sleeping bag. In order to keep warm this night, I had my 35 degree sleeping bag layered on top of my 5 degree bag. I started out with my Big Agnes Insulated Air Core sleeping pad, but woke in the night with a chill. Adding a standard Therm-a-rest sleeping pad on top of my Air Core, I was back to feeling warm fairly quickly, falling back into a comfortable sleep. The next morning, it was pretty tough to crack out of a warm sleeping bag when I knew it was probably below zero outside. I hoped someone else got out first and has already stoked the fire back to life. Pulling on my outer layers, I retrieved my still-warm Nalgene from the foot of my sleeping bag and poured it into my pot for some much needed hot coffee. I was happy to see Matt and Byron stirring around the fire when I poked my head out of the tent. 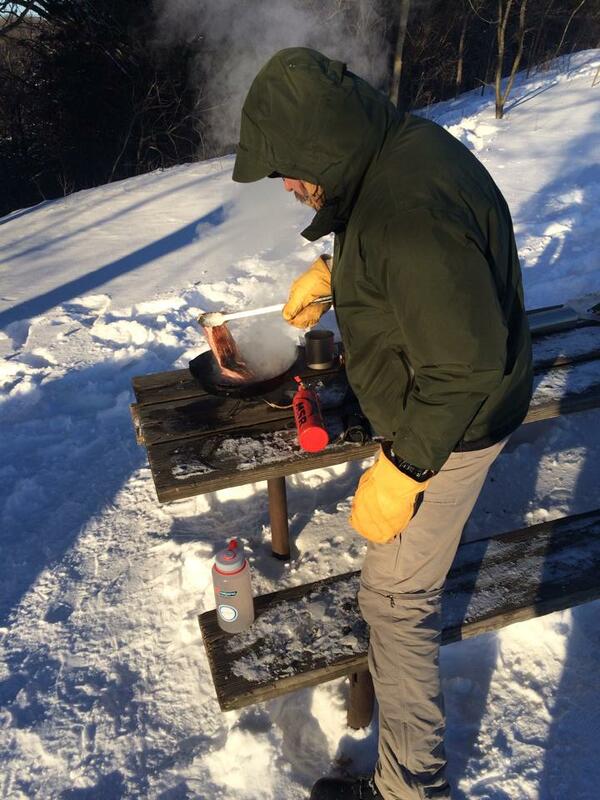 Dumping some more hot water over granola, I headed over to the fire. Once finished with breakfast, we packed up camp and made our way back to the parking lot. 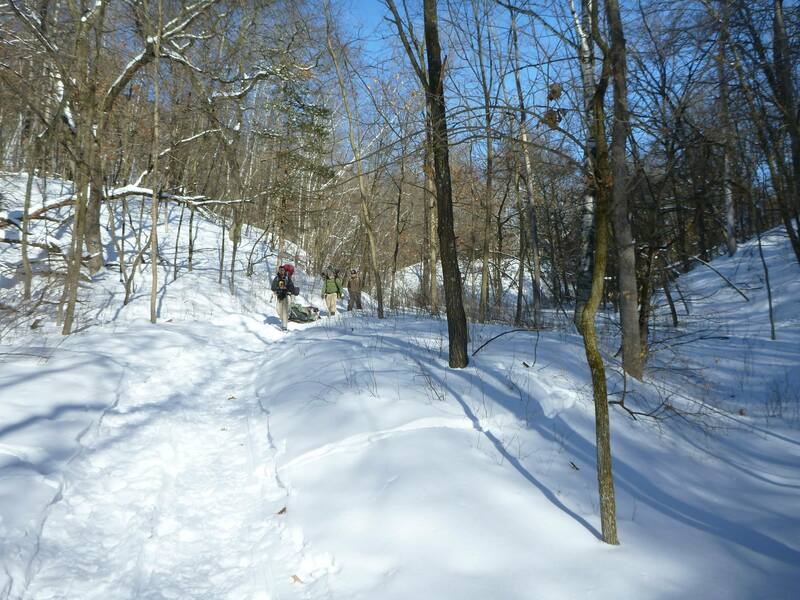 The still wind and bright sun allowed us to heat up quickly as we hike out and rode our sleds down from the ridge. We set out for a cold camping experience, and I bested my previous low by at least 20 degrees. Things learned: Synthetic gloves melt when tending the fire; leather is king. 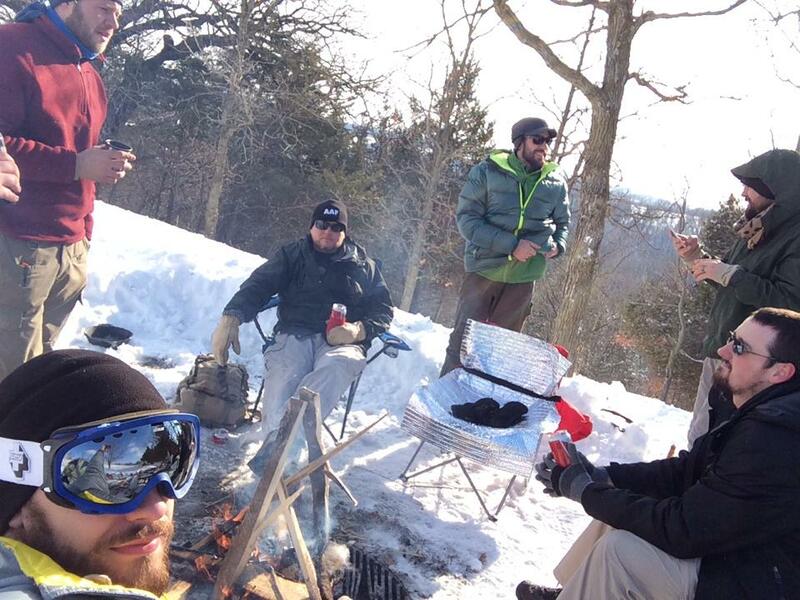 Thin denier jackets tear when sledding down a brush covered hill on a five gallon bucket. Cooper is for hire. So, I had not read this until today. I’m the Jason in the story. I look forward with starry eyes to the next one! See ya in 40 days Brother!